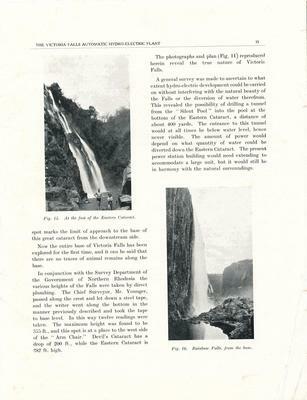 DURING 1937/1938 MY FATHER C.G.T.CLARKE WHO WORKED FOR THE ENGLISH ELECTRIC COMPANY AS A HYDRO ELECTRICAL ENGINEER INSTALLED THE TURBINES AT THE VICTORIA FALLS POWER STATION, HE WAS AN ADVENTURESOME CHARACTER WHO DECIDED TO DESCEND INTO GORGE BELOW THE FALLS, TOGETHER WITH A YOUNG ENGINEER THEY TIED A ROPE TO A TREE AT THE TOP OF THE GORGE DOWNSTREAM FROM THE FALLS AND SCALED DOWN. 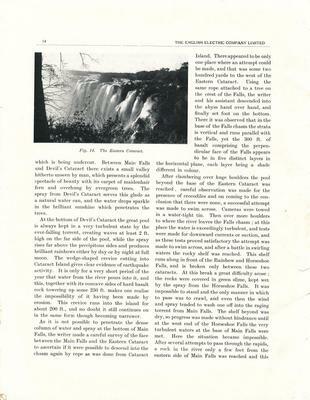 WHEN THE NORTHERN RHODESIAN GOVERNMENT HEARD ABOUT MY FATHER'S EXPLOIT THEY ASKED HIM TO AGAIN GO DOWN THE CHASM BELOW THE FALLS SO THAT A SURVEY COULD BE CARRIED OUT REGARDING THE VARIOUS HEIGHTS OF THE GORGE, TOGETHER WITH A SURVEYOR WHOSE NAME WAS W. YOUNGER THIS WAS CARRIED OUT. WHEN I WAS VERY YOUNG I RECALL SEEING A PHOTOGRAPH OF A PLAQUE WITH MY FATHER'S AND THE SURVEYOR'S NAME ON IT RECORDING THIS INCREDIBLE ACHIEVEMENT, AT THAT TIME MY FATHER WAS FORTY YEARS OLD, BORN IN NEW ZEALAND. 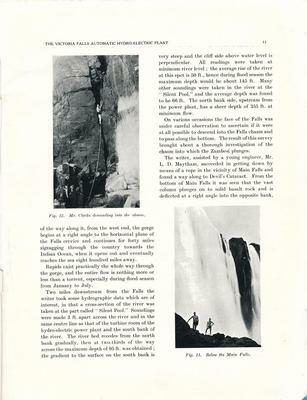 I HAVE ATTACHED PHOTO COPIES OF PAGES FROM A ENGLISH ELECTRIC COMPANY MAGAZINE DATED 1938 WHICH HOPEFULLY CAN BE READ BY ENLARGING VIA THE WINDOWS PICTURE AND FAX VIEWER OR BETTER STILL BY PRINTING THE PAGES, I AM SURE THAT WHOEVER READS THESE PAGES THEY WILL BE ENGROSSED BY MY FATHERS GRIPPING ACCOUNT. Thanks very much for this interesting story. In this format the pictures don't enlarge enough for us to read. Please can you email the pictures through to me and I will upload them in another way so that we can read them.